Olga Ivusheykova was born in Moscow. At the age of seven, she began her musical training at Moscow Gnessin’s music college (pr. A.Korneev, pr. L. Mironovich). Then she studied at the Moscow Tchaikovsky Conservatory with Professor Yuri Dolzhikov. In 2003-2005, she studied baroque flute and early music in Leipzig, Germany in University of Music & Theatre Felix Mendelsohn Bartholdi (pr. B.Csalog). Olga won Russian National Competition in age 16, got special prize in the International Flutist Competition in Scheveningen (Holland) and 2nd Prize in the International Early Music Ensembles Competition “Van Wassenaer” (Haag, Holland). Her graduation from the Conservatory launched both her performing and teaching careers. In 1997, she gained a teaching position at Moscow Tchaikovsky Conservatory where she became an associate professor in 2006. Since 2002 she teaches at the Gnessin’s Music College in Moscow. 2011-2012 Professor, Kurashiki Sakuyo University, Japan. As a soloist, O. Ivusheykova plays with symphony orchestras and instrumental chamber ensembles in both cities of Russia and abroad (Germany, Austria, Holland, Great Britain, Switzerland, Italy, USA). Ensemble performances make a significant part of the concert activity of O. Ivusheikova. She played with such famous musicians as A. Lyubimov, N. Gutman, W Kuijken, M Pekarski, Jan de Win, А. Bernardini, T.Grindenko. She took part in different festivals of modern and early music. 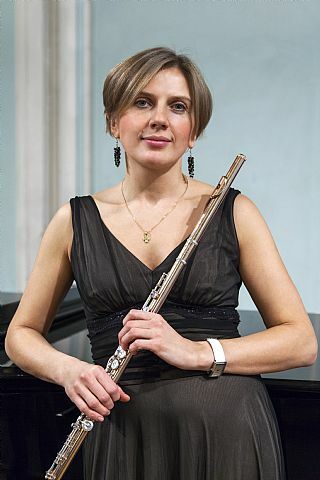 She is regularly asked to be a jury member at flute competitions and she teaches master classes in Moscow, St. Petersburg and many others Russian regions. Olga Ivusheykova has recorded several CDs pieces by J. S. Bach, G. Ph. Telemann, A. Tcherepnin etc. She also made a number of recordings for the Russian Radio Corporation.